THE MARTINI CHRONICLES: 9 Things That Every Professional Diva Should Do for Herself in 2015! 9 Things That Every Professional Diva Should Do for Herself in 2015! 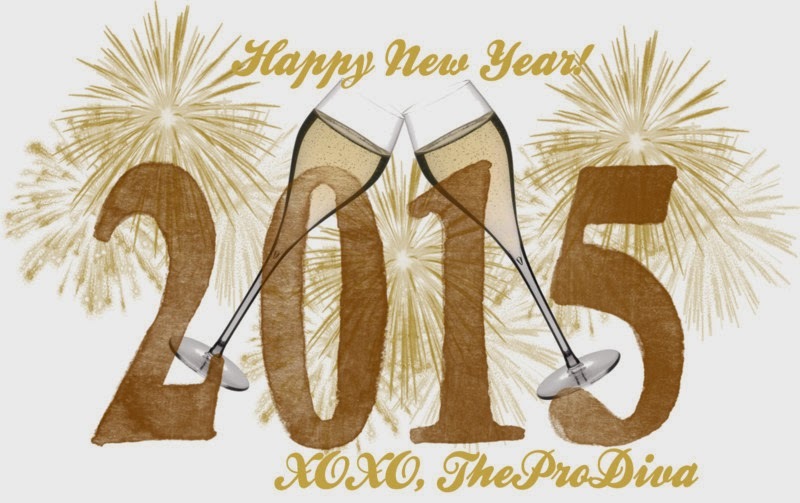 Happy 2015 Divas! I don't know about you all, but I am excited for the new year and its possibilities. I am also excited to leave behind those things (and people) that are keeping me from living my best life; I know many of you feel the same way. At the beginning of each year, I like to highlight things that every Professional Diva should do for herself in the coming year. This list has historically included things that I believe will help each woman improve their health, perform better in the workplace, and achieve a better work/life balance...this year is no different. This year, however, the list is composed of 9 things that I will personally strive to do in 2015. You see, 2014 was an interesting year for me. I learned a lot about myself, both professionally and in my personal life. I took a lot of time to re-prioritize the many things I have going on in my daily life, which has allowed me to put a lot into perspective...things that were not as clear to me before. In short, 2014 was a journey for me in many respects, and this journey has inspired this years list of 9 Things That Every Professional Diva Should Do for Herself in 2015. Ready for the list? Here it goes! 1. Clean Up Your Diet - It's the beginning of the year, and I know that many of you have already resolved to do things to improve your overall health...good for you! Resolving to improve your overall health has always been, in my opinion, a better goal than to simply lose weight. One of the things that is probably on your list of things to do to achieve said overall health is to eat clean. I cannot agree more! Now, I can sit here and give you the general definition of clean eating (eating whole, unprocessed or refined foods), but I don't think that's helpful. What I will do is say that this year, we should all make efforts to clean up our diets and make better choices about the things we put into our bodies. Eat more fruits and vegetables, and less sugar and unhealthy fats. Shop primarily from the outer perimeter of the supermarket. Choose foods that have ingredients that you recognize and can pronounce without any trouble. Do these things more often than not, and you're on your way. The result: you will have more energy...you will feel better...your health may improve...you may even lose some weight. My point is this...as we get older, we have to make better choices to preserve our health. Start improving yourself from the inside out. 2. Don't Feel Guilty or Apologize For Your Successes - This is a big one for me. Last year I found myself, on a number of occasions, downplaying my professional successes because I feared that I would offend certain people. I know this sounds absolutely ridiculous, but it's something that I have always done. Another thing that I've noticed about myself in 2014 is that I am often plagued with mommy guilt...from myself, and from others. I have decided that in 2015 I will not apologize for my successes...no one else does, so I'm over it....period! The mommy guilt, however, is a little harder. But each time I start to feel like a less-than-adequate, working mother, I will remind myself that my daughter is healthy, happy, and well taken care of. I spend the vast majority of my time outside of work caring for, playing with, and loving on her. And when I'm at work, I'm doing what I need to do to support her, and to make sure that she has everything she needs. I will also remind myself that if I didn't work, I may not be able to provide the things that she needs. So guess what...working is a necessity and it does not make me a bad mother. Case closed...no more guilt! 3. Find Meaningful and Effective Ways to Manage Stress - I cannot express how important it is to find meaningful and effective ways to manage the everyday stresses that us working women typically face. It is so easy for us to feel overworked and overwhelmed, which can have minor and major health issues if not checked. In 2015, I encourage you to seriously consider ways to manage your stress. Whether it is exercising, taking a mini-vacation, spending the day at the spa, meditation, or all of the above, do something! Do not just sit around being all stressy...not good! 4. Help Someone in Need - Each morning when I pull out of my driveway to head to work, I say a prayer asking the Lord to bless us (my passengers and I) as we go into the world for the day. In addition, I thank Him for all of the blessing he has bestowed upon myself and my family...and I mean it! Many of us have been blessed with a career that allows us to put food on the table, a roof over our heads, and clothes on our backs. There are others, however, who are not as fortunate; as such, I recently began asking Him during my morning prayer to help me help others. In 2015, I encourage you to find ways in which to help someone in need. You can work with a local organization to do a coat drive this winter, or work with a homeless shelter to help feed its residents, or you can start something on your own...the possibilities are endless. The point of this is to recognize that you are blessed, and that you should reach out to help others; it's the right thing to do. 5. Do Fun Stuff With Fun People - A life that's all work and no play is boring...it just is! And since you are a hard-working woman, and you probably know a bunch of other hard-working women, why not get together and do fun stuff! I recently assembled a small group of lady lawyer colleagues and started a girls group so that we can do fun stuff together. "What's on the agenda" you ask? Whatever we want! Broadway plays, spa days, mud runs, a night at the movies, a trip to the Wendy Williams Show, wine tours...we've got tons of ideas. And we're going to have FUN! In 2015, I encourage you to assemble a small group of folks, and have some fun. Balance out the work and the play. 6. Assemble Your Medical Team - As I get older, one of the things that I have become passionate about are women health issues. Specifically, I am an advocate for women obtaining the appropriate health screenings at the appropriate times in their lives. I understand that professional women tend to forget or perpetually reschedule their doctors' appointments because "something came up," but one's health is nothing to fool around with. As such, in 2015 I encourage professional women to start building their medical team. What do I mean by medical team? Your medical team is your list of physicians and/or specialists that are tasked with handling your total health. Your team should, at minimum, include a general practitioner, an OB/GYN practitioner, a dentist, and an eye care physician. Other team contenders are podiatrists, chiropractors, and dieticians. If necessary, your team should also include any specialists required for any of your specific health needs, such as a cardiologist or an endocrinologist. Your general practitioner may be a good place to start your search for physicians to draft to your team. Take care of yourself ladies! 7. Educate Yourself - I have been working in my current field for over 7 years, and it is increasingly important for me to stay abreast of the issues surrounding this field. New laws and regulations are constantly changing my thinking on many issues that I tackle every day. To do my job effectively, I must constantly educate myself on these changes. As a professional woman, it is important that you continue to educate yourself within your field. You must stay on top of changes and nuances so that you too can do your job effectively and continue to be the superstar that you have already proven yourself to be. So, invest in that new textbook, take that online course, and stay on top of relevant news articles. Do what you need to do to keep your skills fresh. 8. Use Your Vacation Days - This is another thing that I plan to do in 2015...and you should, too! You have them, so use them! I can't tell you the number of professional women I know who refuse to use their vacation days. The reasons why they choose not to use them vary; some are worried that they will lose their footing at their job, and some simply claim that they are way too busy to take time off. I would personally like to go on record in saying that using your vacation days is a necessary element in maintaining a healthy work life/personal life balance. You need that vacation time to unwind and reboot. For those of you concerned about losing your footing at work or being too busy to vacate, I offer you the following suggestion: plan. Take a moment at the beginning of each year to plan when you would like to take your vacation. Consider where you may want to go and how long you plan to be away from the office. Once you have your dates in place, plan your workload with your vacation in mind. Hopefully, planning will alleviate some the anxiety that accompanies any discussion regarding taking vacation time. However you choose to work it, make sure you use your vacation days. You have them, so use them! 9. Subscribe to the Martini Chronicles - You had to know this was coming! As I stated earlier, I have learned a lot in 2014...which means that I have to spill all the tea in 2015. You do not want to miss it! Subscribe to the Chronicles by entering your email to receive every post in your inbox. Also, don’t forget to LIKE the Chronicles on Facebook, show me some Bloglovin, and follow me on Twitter (@TheProDiva). Have a blessed and prosperous new year! Chat with you soon! Happy New Year Bobbie! Thanks so much for sticking by me and my little blog! Wishing you a prosperous and healthy new year! Great list here; I'm definitely working on #6. After the last 2 years of dealing with my parents' illnesses, I want to be ahead of things when it comes to my health!